Yolanda Fundora , an extremely prolific designer, author, graphic artist and children’s book illustrator, is one of QuiltWoman.com’s talented quilt designers. Recently, we had the pleasure of chatting with Yolanda about her work and her company Urban Amish. QW– Urban Amish is a very interesting name for a business. Where did the name come from? YF– I grew up in New York City. The Amish sensibility seems to be an uncluttered, deeply rooted, meditative and practical approach to the art of quilting. To someone bred in an urban setting such as NYC these qualities are appealing. Actually, they are essential to my well-being. So when choosing the name of textile design business the juxtaposition of Urban and Amish seemed a natural. QW– Why did you decide to become a quilting artist? YF– Quilting was something I came to after about 10 years of fabric design. I think it funny now that in the early stages of my textile design career I would be horrified at the thought that quilters were cutting up my fabric designs into little bitty pieces. I caught the quilting bug myself though and had to learn to sew in order to create some of the quilting ideas that were clamoring to get out. Now I can’t wait to cut up my fabrics with a nice and sharp rotary cutter. QW– You are a highly talented textile designer but also are a digital fine artist with museum and gallery exhibits to your credit. Tell us more about that. YF– I started making digital art in 1984 when I got my very first 512K Mac. Funny to think that now that’s the capacity of a very small flash drive. I’m currently working on a book called Toward a Digital Aesthetic: the art of Yolanda Fundora. My textile and quilt designs cross-pollinate with my fine art work constantly. The repeats I use in my fabric lines provide me a great textural library to choose from for my digital imagery. My digital fine art frequently incorporates the geometries inherent in my quilt design. QW– You have some unique fabric lines. What inspires them? Do you have a personal favorite? YF– My fabric lines usually have two distinct inspirations: what flowers I’m interested in and what textures and colors I’m drawn to and want to have available as fabrics. I’m currently very excited about my Crushed Blender line. I find I go to it a lot when developing new block ideas. It has a good range of colors (20) and just about the right amount of texture for just about any use. Here’s my UrbanAmish logo (a crossed canoe block) all in shades of Crushed. QW– What is your favorite quilting technique? YF-Paper-piecing. I love the accuracy it gives me. My sewing is not so good since I learned to sew rather late. When I paper-piece it turns out how I wanted it to be. I’m hoping to publish a series of paper-pieced patterns soon with Quiltwoman.com. Here’s a sneak peek at one I’m currently writing up. It will include three paper-piecing templates for sample shown is the warm colorway of Landscape Quiltercanoe block) all in shades of Crushed. 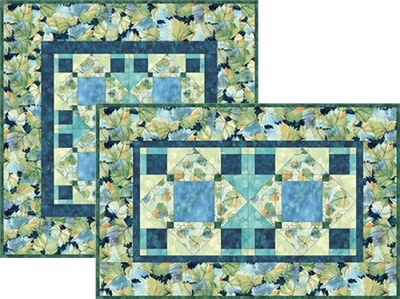 QW– We carry many of your amazing quilt patterns at QuiltWoman.com. What is your favorite? YF- I have two: Owlettes and Jolly Old St. Nick. I find the owls just plain cute. The Owlettes are a pattern I recommend for beginners wanting to try fusible applique. They go together extremely quickly and easily. I like the way St. Nick emerges from the background fabric. I think it’s a cool effect. Wanting to explore that effect a bit more in the future. 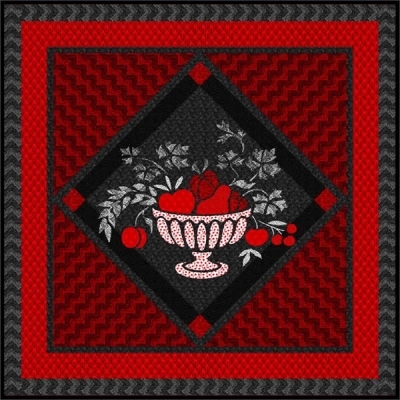 QW– Many of your quilt patterns incorporate fusible applique. Why is this a popular choice for you? YF– Fusibles allow me to do the closest thing to drawing with fabrics. As an illustrator this is very appealing. And I love the ease. When Barbara Campbell and I were working on our Fuse It and Be Done book we were having so much fun with it that we wrote a book with twice the number of projects needed. QW– When you are not quilting, designing or drawing, what can you be found doing? YF– Playing Squash. I hate exercise machines but I’ll happily run around panting for 45 minutes racquet in hand in an enclosed space after a little black rubber ball. I get to yell, run around and not act my age and no one can tell me not to. Pure joy. QW– What is your favorite quote? We hope you enjoyed our interview with designer Yolanda Fundora! 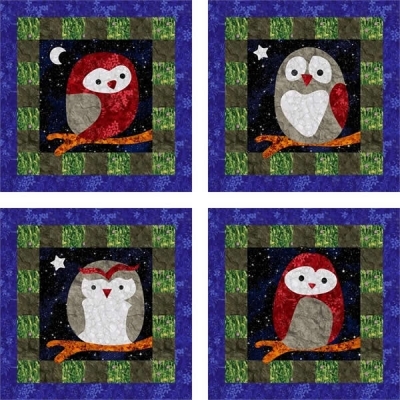 This entry was posted in Designers, patterns, QuiltWoman and tagged Barbara Campbell, jolly old st nick quilt pattern, owlettes quilt pattern, sideways quilt pattern, urban amish, Yolanda Fundora. Bookmark the permalink.